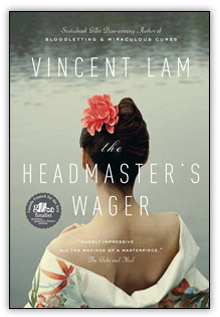 The Headmaster's Wager has the makings of a masterpiece." ercival Chen is the headmaster of the most respected English school in Saigon. He is also a bon vivant, a compulsive gambler and an incorrigible womanizer. He is well accustomed to bribing forever changing lists of government officials in order to maintain the elite status of the Chen Academy. He is fiercely proud of his Chinese heritage, and quick to spot the business opportunities rife in a divided country. He devotedly ignores all news of the fighting that swirls around him, choosing instead to read the faces of his opponents at high-stakes mahjong tables. But when his only son gets in trouble with the Vietnamese authorities, Percival faces the limits of his connections and wealth and is forced to send him away. In the loneliness that follows, Percival finds solace in Jacqueline, a beautiful woman of mixed French and Vietnamese heritage, and Laing Jai, a son born to them on the eve of the Tet offensive. Percival's new-found happiness is precarious, and as the complexities of war encroach further and further into his world, he must confront the tragedy of all he has refused to see.